Sunday Photo; Cherry Blossom Gate – Wake Up and Laugh! It’s just about cherry blossom time in Seoul. I’ve heard from my friend that they’re already out in the southern parts. 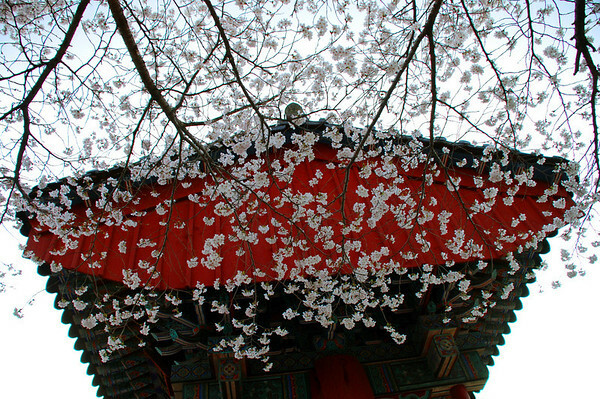 When I think about what I’ll miss when I finally leave Korea, mountains, temples, and cherry blossoms are the first things to come to mind. Where will you go to after leaving, aren’t there cherry blossoms and other blossoms in the spring too? Blossoms are beautiful (and often allergenic) but they are temporary, so don’t worry about missing anything. Just do your practice of inward seeing, then the outwards blossoms and mountains and temples will always be with you.